Have you ever heard of Amazon’s Alexa or Google’s home? They are both revolutionary home assistants that have provided people with instant information, music, light switches, and so much more. Not wanting to fall behind in the technology game, Apple created their own version of this, and it’s really cool. The Apple HomePod is finally available for purchase. The HomePod is a powerful smart speaker with Siri built-in as an assistant. You can control your smart home devices, like Nest and Philips Hue Lights, just by asking Siri. HomePod can also provide you with the latest news, current traffic conditions, sports scores, and upcoming weather forecasts, among many other things. HomePod responds to both voice and touch making it convenient and easy for almost anyone to use. Siri is listening when the LED waveform animates with your every word. The HomePod also has a feature where it adapts to its sound based on where it is located in a room. Thus creating the same amazing sound no matter where you are in a room. 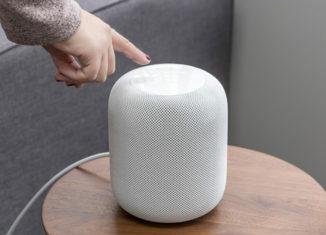 The HomePod is very easy to set up (just plug it into the wall, find your WiFi, and log into your Apple ID), and it comes in two colors – space gray and white. An Apple Music subscription is required in order to play music on the device using Siri, but if you want to play music from any other music app, like Spotify, you need to use AirPlay. Airplay is a feature where you connect your phone to the speaker using your router. Musical entertainment is just another feature of the Apple HomePod. In addition, coming later this year is the ability to pair two HomePods together to create an even more immersive experience.